I'm using Pennzoil Platinum 0W20 based on research others did on BITOG forums and other sources. To get straight to the point it uses tri-nuclear Moly which is superior to old school moly. Lower content of tri-nuclear Moly could be used as a substitute of higher amounts of old school moly. The base stock of PP 0w20 is from natural gas making it a synthetic. I'm assuming its a group 4 oil. Research of Mazda w/moly suggest its base stock may be a really good Group 3 oil. Plus PP's base stock should have less impurities than other group 4 oils. PP has cleaners and detergents which has caught the attention of long time Mobil1 user turned converts implying the PP 0w20 made their engines sound quieter after some time. Since PP's parent company is Shell and I primarily use Shell I figure hey, I'm using oil and gas both with additives made by the same company. Folks posted 10.1% which is well below 13% for Dexos max limits. Seen other post 8.9%. Last edited by CX-5um; 03-06-2017 at 12:28 PM. I'm a big fan of PP. Haved used it quite a bit and it seems to wear the best, that is getting the best oil mileage out of it. Also have used the Mazda Moly quite a bit, but there' not much out there about additive packages other than being loaded with moly. Thanks, good info in this thread. Has anybody done a UOA using amsoil 0w-20? I use amsoil in my wife's wrangler and my Shelby gt500. I just bought a 2017 cx5 and debating what to put in after break in miles are completed. Keep your moly-rich factory filled oil as long as you can! 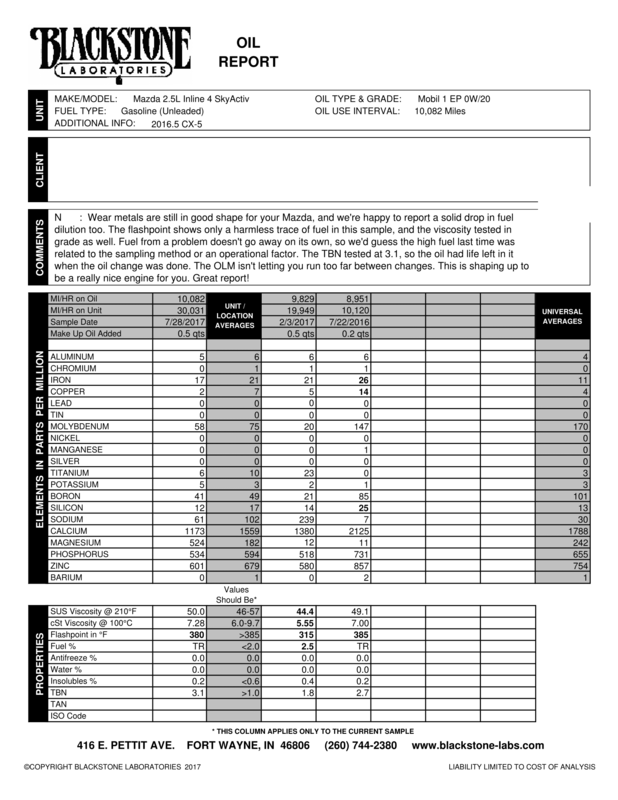 Make sure to use Mazda recommended "Flexible" maintenance schedule for oil change! I had this done before I knew I was trading in my 14 for a 17. Hopefully the 17 engine is as solid as my 14 was over the 75k miles I had it. Wow, nice UOA! What oil and filter was this if you don't mind me asking? Clearly not MMO judging from the Moly number. Regular Castrol 0w20 with a Mazda filter. I get the oil changes done at the dealer and they use Castrol. My dealer had also switched from using Mazda Moly to Castrol. anyone do uoa with a dealer oil change? what is the easiest way to get a sample? Hey everyone! First post here, though I have checked in and read a few threads on occasion. I've been on BITOG for a long time now but never had a need to do a UOA. With the purchase of my second CX-5 (First one was a '14 GT) and the OLM option that was given on the '16.5 model year, I decided it was the perfect opportunity. Based on my driving it seems optimistic. I've never had it get below 50%. Seems to me that the cold weather we experience here definitely is a cause for fuel dilution in the winter. I've got about 1k miles left on this OCI and I suspect to see similar results as UOA #2. I'll be dropping down to 1 year or 8k miles on the next two OCI and see if that improves the dilution results. Let me know if you have any questions! Last edited by RepeatMazda; 02-25-2018 at 06:30 PM.